Growing up, like most guys, I always wanted to be strong and muscular. But I knew I didn’t want to just be a muscle head; I wanted to be functional and able to do stuff! 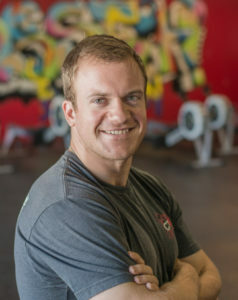 Through my late teens I spent about a year or so with body weight only methods, another 18 months or so adding in kettle bells, and started to hear about this thing called CrossFit as being the ultimate in functional fitness. Finally in 2010 I was able to get involved with a CrossFit gym and dive in headfirst – wow, five years going strong and never looking back! I received my Level 1 certificate in 2012 and have loved every minute of getting to share this crazy, awesome, fun mixed bag of fitness with anyone who will let me. I’m convinced that CrossFit is the most effective way to functionally train, strengthen, and condition your body to be used the way the Creator intended, whether you’re young, old, male, or female. I’m in the process of making a career change into the fire service and have been amazed at how physically well prepared I have been for all the training I’ve gone through. I’m married, with two young children. My passion is to help people learn to use their bodies to their fullest potential and realize they are capable of so much more than they think they are.